A two-day workshop was divided into three parts: one part consisted of movement exercises, meant to experience both the working of a community and the non-verbal elements related to the theme. The designers and coaches of the movement elements were the actor Ferenc Sinkó and Ildikó Ungvári Zrínyi, university professor the Tg-Mures University of Arts. The second part included the evocation of personal stories about birth and their discussion moderated by Kinga Boros, assistant lecturer at the Tg-Mures University of Arts. The third part of the workshop was a performance lecture constructed on a text by Slavoj Zizek, by Attila Szigeti, lecturer at the Faculty of Philosophy of Babes-Bolyai University. Imre Ungvári Zrínyi, lecturer at the Faculty of Philosophy of Babes-Bolyai University moderated and summarized reflections on the event. 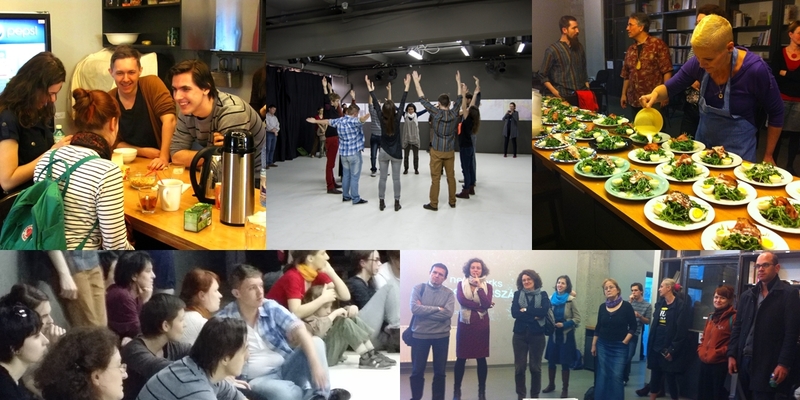 Sándor Sajó, lecturer at the Faculty of Aesthetics of ELTE, Budapest reported about his participation at the IETM meeting in Sofia, where he represented the project. Rita Sebestyén from Babes-Bolyai University and Anikó Varga, editor-in-chief of Playing Area, moderated the discussion about possibilities of cooperation with institutions.